Nicholas McCarthy's chiller doesn't ever hide its big, weird idea for a possession story, but it still goes in some unexpected (and gruesome) directions. It’s not the Devil that’s taken hold of young Miles Bloom, and that’s hardly a spoiler for director Nicholas McCarthy’s gruesome “The Prodigy,” which uses its opening minutes to introduce a new idea to the “possessed kid” horror subgenre and then keeps twisting it into some unexpected shapes — if not the most artful ones. The title hasn’t even come up before a pair of seemingly disparate subplots dovetail into one, as a much-wanted baby is born just as a psychotic killer is gunned down by police. And there’s more: “The Prodigy” isn’t compelled by subtlety. As Edward Scarka (Paul Fauteux) lays dying on the ground, pierced by multiple gunshot wounds, McCarthy cuts to baby Miles, being wiped clean of a set of blood splotches in the exact same spots on his infant chest. Edward’s apparent involvement in Miles’ budding life originally seems like a good thing, as the bouncing baby soon exhibits signs of being incredibly gifted. He starts speaking at just 20 weeks, assembling complicated educational toys before a year is out, even standing over his own crib and reciting menacing words in another language (what? exactly!). “He’s special,” mom Sarah (Sarah Schilling) smiles to husband John (Peter Mooney), and the two remarkably average parents bask in the glow of the revelation that they’ve spawned a gifted child. Well, they’ve spawned something. Miles is certainly advanced, and as he approaches his eighth birthday (when young Jackson Robert Scott takes over the role), he zings through a cycle of violence and manipulation with lightning speed, from going after a classmate with a wrench to easily manipulating an elder to maybe even offing the family dog, all in the space of about three days. Mostly, it works because Scott’s performance works, and while his two-colored eyes (“like David Bowie!,” an innocent admirer coos) and plenty of split-screen shots that hint at the dual nature of his spirit are just fine, it’s the young actor who seesaws between the dark and light in convincing fashion. Schilling’s performance comes into sharper focus when she’s paired with Scott, and by the time she’s shuddering at his very touch and pleas for parental assurance, it’s clear that she’s going to have to keep going into darker territory. Despite a jittery first act, Schilling eventually pulls it off, working towards a chilling final-act performance. Before that, however, she’s just a mom pushed to desperate ends. When a trusted advisor — a rattled Paula Boudreau as a kid psychologist who, like his parents, initially thought Miles was just really, really smart — introduces Sarah to Colm Feore’s Arthur Jacobson, some sort of rich dilettante who dabbles in reincarnation theory for apparent fun, Sarah begs off. And then worse stuff starts happening. Arthur posits that those souls that have returned to Earth are looking to finish something undone — he’s even got a charming example involving a young kid who just wanted to say goodbye to his other-life mother, a loving act that frees both the lost soul and the kiddo hosting him — but there’s little doubt that Miles’ companion, if he even exists, is back to do something sweet. Arthur and Miles’ interactions never reach “Exorcist” level terror (really, what could? ), but they’re freaky enough, and Jeff Buhler’s script adds in enough ambiguity to keep everyone wondering what’s really happening. Attention to detail helps elevate even minor scenes — at one point, Sarah takes a late-night call from Arthur, and when her head tilts just so, it’s actually his name that shows up on her caller ID, not some dummy number; later, she’ll uncover a true crime book that looks entirely authentic. But that doesn’t mean that characters don’t make head-smacking mistakes with regularity, the kind that ensure audiences will be screaming at the screen as they unfold. A pivotal scene involving a visit to a professional that surely would have been recorded isn’t, while Sarah never takes the right amount of caution with her own investigations, even leaving open a laptop filled with clues for a lurking Miles to find. 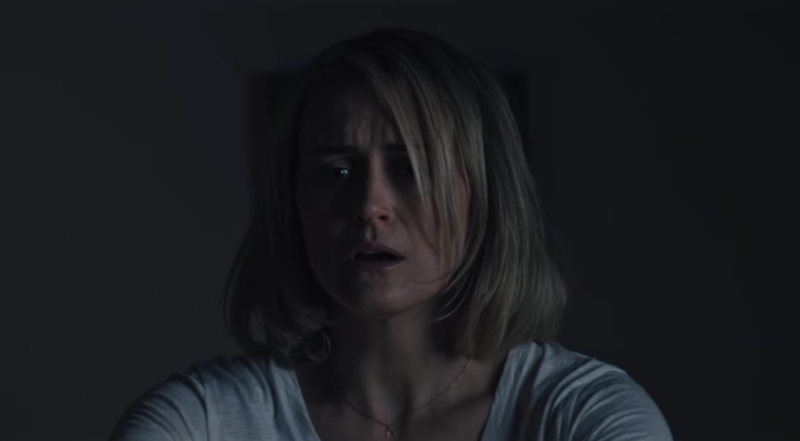 The film is littered with jump scares, but most of them offer up shocking twists that land with genuine payoff: the score winds up, the framing gets tighter, the shots linger for longer, and when a different film might serve up a jump scare with a giddy “oh, it was nothing!” laugh, “The Prodigy” delivers something truly distressing. Punctuated by scenes of gruesome violence and a character with a fixation on amputating limbs (never explained, making it even more wicked), “The Prodigy” could stand to stretch its R-rating to even ickier ends, but its psychological surprises are the ones that really stick. Orion Pictures will release “The Prodigy” in theaters on Friday, February 8.